You can, of course, wear pearls whenever you like as they can be worn with pretty much anything you like. No longer are you restricted to having to wear pearls with evening wear? Before we take a look at how to wear pearls after 5 pm there are some other things that you need to consider if you want to wear pearls now or in the future. These points will help you to find the perfect pieces of pearl jewelry that you can wear time and time again and won’t look out of place no matter what outfit you wear them with and even when you choose to wear them. When it comes to wearing pearls your skin tone is going to play a part, as this will dictate what looks great and what doesn’t. When it comes to how to wear your pearls then follow these simple rules. If you have pale skin tones then you should go for pearls with a rosy tone to them such as lavender or pink ones. However, if you have a darker or olive skin tone then you are better off going with cream or golden coloured pearls. However classic white pearls are great as they actually suit all skin tones and will add a touch of elegance and sophistication to any outfit you choose to wear them with. You need to be choosing pearls that actually flatter your body shape. For taller women wearing a choker style necklace where the pearls are of equal size is perfect. However, if you have a fuller figure you need to stay away from jewelry with small pearls, instead, go for necklaces that have much larger pearls. Along with the above here are some more points to consider when it comes to how to wear pearls after 5 pm. Only wear a long pearl pendant and drop earrings after 5 pm. Make sure you wear a matching pearl jewelry set as these look more coherent. Certainly, when it comes to how to wear pearl set in the evening it is best to keep it simple. Never wear too many bracelets out on an evening especially if you are going to a formal dinner. If you don’t raise your hand enough when stretching out to reach something they will end up banging against things. Not only will they make a noise the risk of you causing damage to your pearls is increased. Make sure that you wear a pearl necklace that fits the shape of the bodice of your top or dress. So if you are wearing a dress that has quite a high neckline opt to wear either a pearl choker or long string pearl necklace. So when it comes to how to wear your pearls make sure that you always take into consideration the neckline of your dress or top. What will be more exciting than going out for the evening whether for dinner with your partner or to a party? But wearing some really lovely pearls will add a touch of elegance and class to your look. Here’s our guide to wearing pearls after 5 pm no matter what type of occasion it is you are going to be attending. If you are going to be wearing an evening gown then pearls as an accessory to the outfit are the perfect choice. They are actually the perfect choice for any formal occasion you will be attending. The elegance of your long dress is going to be perfectly complemented by a classic string of pearls around your neck or wrist. It is best if you keep things simple if you are going to be wearing something that is a little dramatic. For example, wear just a simple pearl choker or princess length necklace and a pair of simple pearl stud earrings. However, if the dress you are wearing is a little more understated then, of course, you could be a little more adventurous. You could, for example, choose to wear a simple red chiffon dress with a necklace made from black pearls. Finally, if you intend to wear long formal gloves especially black ones then to really add that final touch of glamour to your outfit put on a beautiful white pearl bracelet. You could also be a little bolder and choose to wear a bracelet made up of cream, gold or lavender coloured pearls if you wish, just make sure that they complement the rest of your outfit. When it comes to semi-formal events you have a lot more opportunities to be flexible about the kind of pearls you wear with your outfit. Of course, like so many others you can keep things simple and go for the usual classic strand of pearls. But why not be a little more daring and opt to wear a much longer pearl necklace that you can then wrap around your neck several times if you wish. You could also think about going down the same route as was often chosen by many women during the 1950s. Here women would wear simple elegant black dresses, which they then teamed with a classic pearl necklace or choker. In fact, this is one of the best ways of how to wear classic pearls. If you need inspiration take a look at they look often chosen by the lead actor in “The Marvelous Mrs Maisel” or the look that Audrey Hepburn chose when starring in “Breakfast At Tiffany’s”. If you are going out for the evening with your girlfriends you may think that wearing pearls is a little over the top. But this isn’t true, as wearing pearls after 5 pm can add a really pretty touch to any outfit whether you choose to wear a dress or some elegant pants and shirt. The great thing is that when it comes to wearing casual outfits and pearls you can experiment a little more. You can choose to wear any kind of necklace, bracelet or earrings that you want as long as they complement the rest of your look. For example, why not team a beautiful pearl charm bracelet with jeans and a nice cream or white shirt. Otherwise, you can opt for a necklace or bracelet made up of several different colour pearls to give your outfit a trendier look. When it comes to how to wear your pearls, there is one piece of jewelry that is essential for your evening attire, and that is a beautiful pair of pearl earrings. Simple stud pearl earrings are perfect for wearing during the day but when it comes to the evening you need to look at wearing a pair that are a little more dramatic. 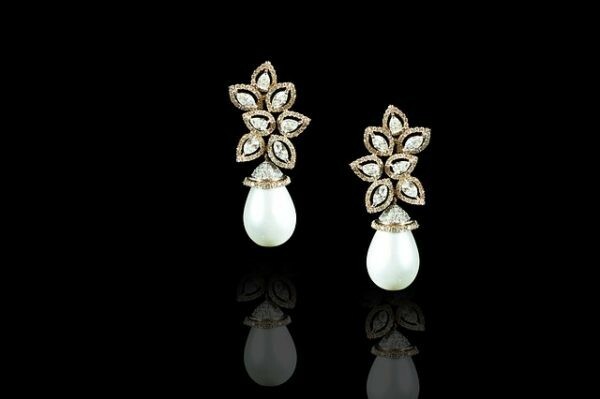 So you should opt for a pair of beautiful of drop pearl earrings. But again you need to consider the kind of outfit you are going to be wearing and the kind of event that you are going to be attending when it to choosing the right pearls for evening wear. For those casual evenings out with friends, you can choose to wear a pair of pearl teardrop earrings. However, for more semi-formal or formal events then wearing a pair of chandelier or dangling pearl cluster earrings is perfect. Also, make sure that the pearls you choose complement the rest of your outfit. So if you are going to be black then opt for classic white pearls or even some pale pink or lavender ones. Of course, if you are going to be wearing white or red then you may want to consider choosing to wear pearl jewelry made from black or cream coloured pearls. We hope that you find the information we’ve offered above about how to wear pearls after 5 pm useful. Certainly, you will probably come up with some of your own ideas, but as long as you keep in mind what we’ve suggested then you should create a unique look for you that will still look elegant and sophisticated no matter what kind of event it is you are going to. Here at Pearlsonly.com, we have a lovely array of different kinds of pearl jewelry for you to choose from. New pearl additions can be found in our collection. So finding something that not only suits your particular tastes but also your personality shouldn’t prove at all difficult. What is important however is that you make sure that when deciding on how to wear pearls after 5 pm that you choose pearl jewelry that will complement the rest of the outfit you are intending to wear when going out.